While the rest of the city was still reeling from the Giants game — that was the type of loss that even Jets fans had to wince at — the Jets were taking a turn at salvaging a season that was in danger of spiraling out of control. Around the exact same time that DeSean Jackson was running that punt return back, Brad Smith was taking back the opening kickoff for a touchdown and giving the Jets a lead, and a good start, they so desperately needed. They still required a lot of work after that, but they did it, they pulled off a massively needed upset, and the season is theirs, again. What was so nerve-racking about that drive was not just that it was so important to the season — and boy, was it — but that the Jets had done everything right and still almost lost. The Jets often have to win games like that (this is now six of their ten wins that have been by a touchdown or less), and at the beginning of the year, they had the confidence and swagger to provide comfort that it would turn out all right, no matter how close the score. After the last two weeks, suffice it to say, there was little comfort. The Jets are almost certainly going to make the playoffs now. Even if they do something crazy and lose their last two (at Chicago and home against Buffalo), they're still probably in. (See? Honest.) Had they lost yesterday, they would have to win both those games and cross their fingers. Now, it's very likely — particularly if they can beat Chicago next week, though it's probably not necessary — that they can rest everyone in a meaningless Week 17 game. They won't catch the Patriots, but no one's catching the Patriots right now anyway. The Jets might not be the Super Bowl champs they told us they were, but yesterday assured that they won't be a total disaster. Heck, they might even have a couple of weeks now to get everything back right again. Tragedy averted. 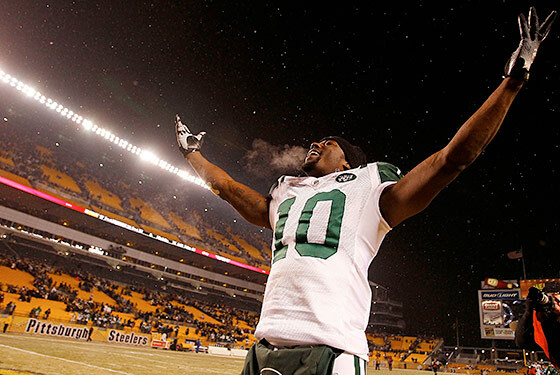 The Jets will be a playoff team again.